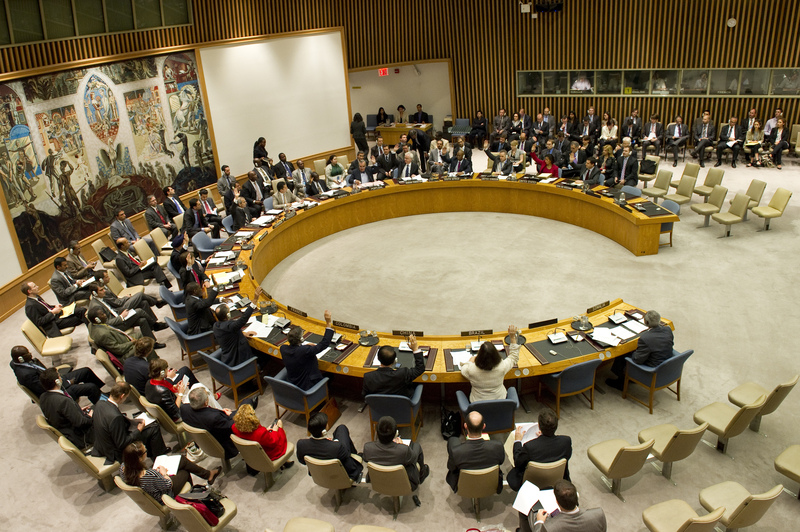 The UN Security Council: Is it bankrupt? The EGMONT Institute, together with United Nations Associations in Belgium, Vereniging voor de Verenigde Naties and United Nations Regional Information Centre, hosted an event ‘The UN Security Council: Is it bankrupt?’. The guest speaker of the event was Under-Secretary General of the United Nations, David Malone, who is the Rector of the United Nations University in Tokyo. Special Envoy Werner Bauwens from the Belgian Ministry of Foreign Affairs chaired the conference with Michel Adam (APNU) and Luk van Langenhove (UNU-CRIS) opening the event. Since the end of the Cold War, the UN Security Council has undergone significant changes driven by a variety of factors, however, certain institutional issues still remain that prevent the Council from reaching its full potential. The relationship between the five permanent members (P5) of the Security Council (China, France, Russia, US and UK) started to transform already in the late 1980s, as they realised that there was increasing flexibility on topics and actions they could discuss. This change in the relationship also opened the Council to issues that had been sidelined for years, such as Namibia’s independence process. The resolution, authorising the use of force following Iraq’s invasion of Kuwait, underlined the change in the attitude of the Council as well as the widening issues it was willing to address. The first half of the 1990s was characterized by increased activity from the Security Council. It authorized several peacekeeping operations to address a new generation of conflicts, civil wars, that were breaking out in Central America, Africa and in the Balkans. After the Cold War and the Gulf War, Chapter 7 of the UN Charter, which includes the actions and measures the Council can authorize to ensure peace and stability, has become more routinely used and now approximately a third of all resolutions include some aspects of it. In comparison, during the Cold War, Chapter 7 was invoked only a few times; for sanctions on South Rhodesia and South Africa, and for the use of force in Korea and more indirectly in the Congo in the 1960s. Civil wars are often much more complicated than wars between governments and thus it is more difficult to stop them. Civil wars are more fluid, with shifting identities and goals, changing leaders and numerous parties to the conflict in the form of the government and rebel groups. It is often difficult to distinguish between the parties and it is extremely difficult for the UN to meaningfully intervene in such conflicts. More than once, the Security Council has underestimated the complicated nature of civil war and it has mandated a peacekeeping operation with disastrous results. In the early 1990s, the UN was in a sort of ‘can do everything’ euphoria and issued mandates for peacekeeping operations to places like Somalia and the Balkans. This increased activity resulted in the organisation being overwhelmed and overstretched. The UN increasingly turned to other organisations, such as the EU and OSCE and NATO, but often these collaborations have been difficult with reluctance to let go off the overall control. The changes that have taken place have been motivated by several factors. The humanitarian imperative has become central to the Security Council activities with increasing concern over the cost and quality of life. The well-publicised setbacks in Somalia and the Balkans have made the Council more careful, but humanitarian objectives remain a main driver for action. Other drivers include terrorism, human rights and the (re)introduction of democratic politics. Human rights became one of the central objectives to be included in all UN peacekeeping mandates following the civil war in El Salvador. Elections have often been seen as the end goal of the UN operations, but the organisation has understood that successful elections do not guarantee lasting stability and democracy. The introduction of international criminal justice has been one of the central institutional issues for the Security Council since the Cold War. It emerged in the aftermath of failure in the Balkans and due to the inability to prevent genocide in Rwanda, as a means to address grievances through ad hoc tribunals. The setting up of the tribunals created a demand for a universal court that would allow for other conflicts to be addressed and hence the Rome statute establishing the International Criminal Court was adopted in 1998. The Court has produced mixed results with too many cases in Africa and none elsewhere, however, the international justice has become such an integral part of international system that it is often taken for granted. The reform of the Security Council has been discussed almost since the creation of the organisation. The world has significantly changed since 1945 and the Council should reflect these changes. However, several reasons have prevented the reforms from materialising from the P5 being reluctant to let go off its privileged position and veto power to the inability of aspiring new permanent members to convince the majority of the UN membership of the benefits of expanding the permanent membership of the Council. New permanent members can ever be added without a veto which would make them in a sense ‘second class’ in relation to the P5. This is likely to complicate the reform process that has been on-going since 1993 even further. In the current process, there has been no significant progress on the composition of the Council but the working methods of the Council have become more transparent. The suggestion of making regional organisation Council members is an interesting one, but not feasible because of the non-existence of politically significant and unified regional organisations in all regions. Furthermore, the UK and France have come up with creative ideas to limit the use of veto, such as the requirement of double veto and limiting its use to only resolutions including Chapter 7. However, these suggestions are unlikely to gain the support of other permanent members. The UN and especially the Security Council is judged more on its failures and disagreements among its members than on its successes. However, even a strong mandate and willingness to address a conflict does not necessarily overcome the situation on the ground. The Security Council has seen significant increase in activity as well as transformation in the issues on its agenda since the end of the Cold War. All these changes and developments, ranging from international criminal justice and human rights to the involvement in civil wars and the increase in humanitarian considerations, point to the slow eradication of the Westphalian structures. Today, states still remain the most important actors but the era of absolute sovereignty has passed. This entry was posted on 26/05/2014 by ISIS Europe in Conferences, Contributors, Saara Ilmonen and tagged APNU, Egmont, The UN Security Council: Is it bankrupt?, un reform, un security council, United Nations Regional Information Centre, UNSC, UNU-CRIS.